The Lurie Gallery presents James Georgopoulos, Guns of Cinema, opening Saturday, April 28, 2011 from 6-10pm in Santa Monica. The exhibition includes works from the collection of fire arms used in many film and television productions such as the Sopranos, Godfather, and Mr. & Mrs. Smith. 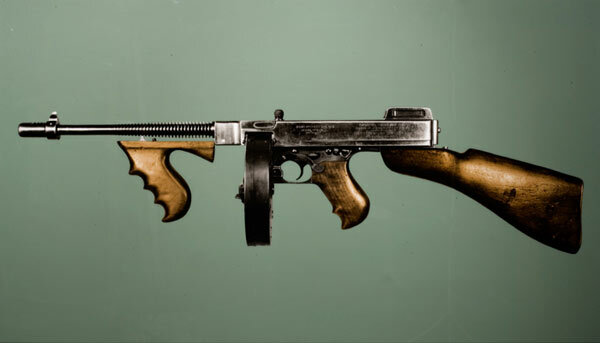 The extremity of the work pulls the image of the weapon into a large scale frame, allowing viewers to feel the threatening power, but are drawn into the sleek and lustrous feel of the make and style of the gun. The identity behind each prop has a futuristic element through the isolated color of the photograph, but holding a past tense history from which it first originally appeared in their own film. From semi-automatic pistols, machine guns, revolvers, and gats of sorts, the world of cinema has created a fascination of things that go “boom”. Georogopoulos creates a standpoint for the viewer to evaluate their sense of fear or seduction, freedom or protection, and power or weakness through one single object.